Diamond is the hardest known to the mankind and only diamond can process the hardest of all materials. Natural Diamond is very hard, is also very sensitive to impact, vibrations and heat caused while machining. Although natural diamond can perform better than conventional tools on certain material, it proves to be economically unviable. This is due to not only the high cost of natural diamonds but also the additional costs involved in investing in a range of new machines. By man's ingenuity through the manufacture of Polycrystalline Diamond (PCD) Cutting Tools, the Problems posed by Natural Diamond have been eliminated. The main characteristics of PCD cutting tools are the great economics achievable in terms of cost per component, their repeatability and their predictable long life. PCD has all the positive properties of natural diamond, thus there are no sacrifices made on the hardness of the tool or the surface finish of the component. Man-made diamonds are produced from the purest form of graphite. Under conditions of high pressure and temperature,in the presence of certain catalysts, graphite gets converted to micron-sized diamond crystals. The crystals are then finely graded and sintered together with tungsten carbide to produce different grades of PCD blanks. PCD Cutting Tools are used to machine non-ferrous components. PCD tools are most frequently applied in the automobile Industry - comprising both heavy and light motor vehicles Some of the materials that have been cost effectively machined with solar PCD Tools include are aluminium alloys, copper, bronze, abrasive plastic composites etc. 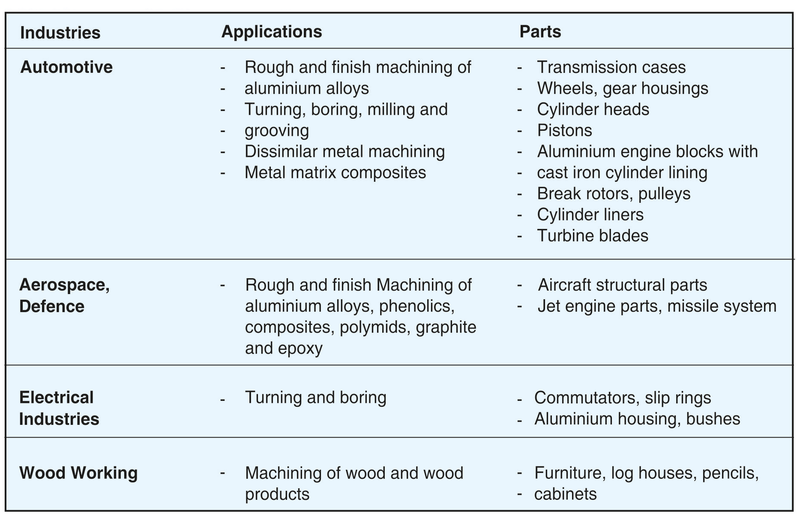 The most significant application of PCD Cutting Tools, in this new generation of aluminium engine manufacturing, is to machine dissimilar materials such as aluminium engines with grey cast iron cylinder liners - either cast or pressed along with the aluminium - which have to be finish machined along with the aluminium blocks. Cubic Boron Nitride (CBN) is the hardest and most abrasion resistant material known to man, next only to Diamond. The manufacturing process and physical properties of CBN are very similar to those of PCD, except that instead of graphite, boron nitride is the building block for CBN. Like graphite, boron nitride is subjected to high temperature and pressure in the presence of catalysts to form cubic crystals of various micron sizes. These crystals are then graded and sintered together with tungsten carbide as the substrate, to form integral CBN blanks. Like in PCD, the crystals within a CBN blank are also randomly oriented resulting in uniform hardness and abrasion resistance in all directions. The toughness of cemented tungsten carbide combined with the hardness of the CBN layer enables CBN Cutting Tools to withstand the high cutting forces encountered while taking heavy cuts in tough, hard-to¬machine material. It also results in high impact resistance needed to withstand the shocks of severe interrupted cuts. The CBN layer also has very high thermal conductivity- much higher than carbides and especially higher than ceramics. This allows the cutting tools to dissipate the heat generated at very high speeds of machining applications much more efficiently than seen with either carbide or ceramic tools. Unlike conventional cutting tools, CBN does not weaken or soften at very high temperatures. At machining temperatures up to 1000°C, polycrystalline CBN has the advantage of being completely chemically inert as well as retaining its strength and hardness at the cutting edge. The current trend is that of CBN Cutting Tools replacing conventional grinding because of their ability to achieve removal rates up to 10 times greater than grinding. A. For rough machining of hard, super alloy or cast iron, CBN tools with approximately 90% by volume of CBN, along with titanium nitride and other binder materials are used. B. For finishing of hard metals and alloys, CBN tools with approximately 65% by volume of CBN, along with titanium nitride and other binder materials are used. C. For heavy material removal rate and heavy interrupted cuts, Solid CBN is used. This type of CBN has no carbide backing; instead, CBN crystals and ceramic phases are sintered together using an advanced high pressure-high temperature process. The Solid CBN has enhanced properties of high fracture toughness, wear resistance and chemical stability making it ideal for this type of heavy machining. The ceramic component provides improved chemical stability, enabling the superior qualities of CBN to be utilised in high-speed finish machining environments. Another observable trend is the increase in use of round inserts. This shape of inserts has proved to be the strongest and most economical shape. It is the ideal shape when machining large rolls or parts, which demand longer machining time and therefore are likely to generate a large amount of heat. Thus, round inserts are used in the machining of hard facing alloys, hardened steel rolls, powdered metals and hard and soft grey cast iron. Traditional methods of following up the machining process with grinding have undergone a drastic change with the advent of material such as PCD and CBN. Because of their high abrasion resistance and their ability to machine the hardest material in industry, both PCD and CBN fall into the special category of Superabrasives. When does one use Superabrasives?